A simple recipe for a delicious, creamy, ice cream cake, using your choice of cake mix and ice cream. The possibilities are endless! Prepare cake mix as directed and cool for 30 minutes. Remove cake from pan and put in freezer for 1 hour. Once ice cream is thawed, remove cake from freezer and top with ice cream. Place cake back in freezer for 1 hour or until ice cream is frozen again. While cake is in freezer, pour whipping cream, vanilla, and sugar in bowl of stand mixture. 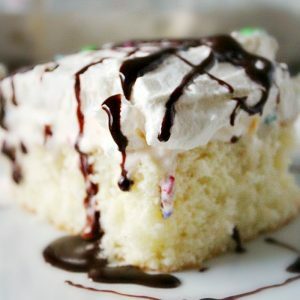 Take cake out of freezer and top with whipped cream. Cover and freeze for 1 hour before serving. To serve, run knife under hot water for 1 minute. This makes the cake easier to cut through without thaw time.